Sanhelios Curbita™ Bladder Caps, 30 Soft Gels - 1,000mg (Bioforce) - Penn Herb Co. Ltd. Healthy bladder function is crucial to a person's mobility and overall quality of living. 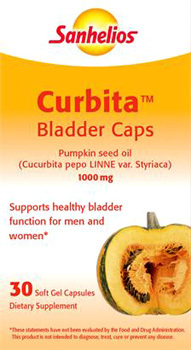 Curbita™'s precious ingredients support the entire system of bladder muscles. It supports normal emptying of the bladder because Curbita has a calming and harmonizing effect on the function of bladder muscles. This leads to a strengthening of the functional-urinary system for men and women. AMOUNT PER SERVING (1 CAPSULE): Pumpkinseed Oil (Curbita pepo) entire seed 1,000 mg. OTHER INGREDIENTS: Gelatin, Glycerol, Water. Gluten Free. Non-GMO. No Sugar. No Preservatives. No artificial coloring. No artificial flavoring. Support for healthy bladder function for men & women. Adults, take 3-4 capsules during the day and swallow whole with some liquid.